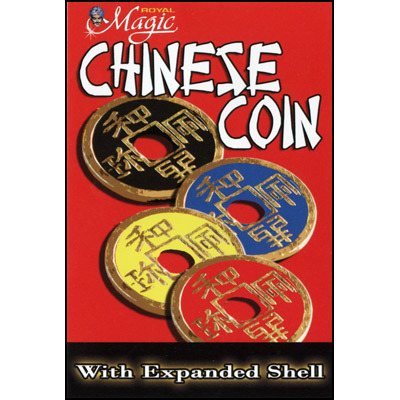 Today, when you order "Expanded Chinese Shell w/Coin (BLACK)", you'll instantly be emailed a Penguin Magic gift certificate. You can spend it on anything you like at Penguin, just like cash. Just complete your order as normal, and within seconds you'll get an email with your gift certificate. 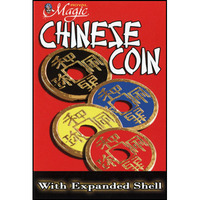 Precision made, these expanded shell coins are manufactured to nest over the popular Royal Magic Chinese coins. Using a coin and shell together, a limitless number of tricks are possible, including Matrix routines, Coins Through Table, vanishes, color changes, and many more. Supplied as a set - one shell and one black coin per set, polybagged with color header and complete instructions offering one trick plus tips and suggestions. I agree with Troels,plus the extra coin that came with it,wouldn't fit inside the shell. The shell is made from a pressed piece of thin metal, not from an expanded coin. If it is placed beside the real coin it looks fatter, bigger and with rounded edges. Not usable for close-up work.